Cognex Gen 2 is the latest in vision systems and their In-sight series. FPE Automation is thrilled to be the 1st place winner of the 2017 award for strategic Gen 2 sales! 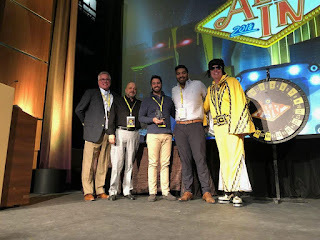 This award is prestigious because the Cognex partners in the other markets we sell alongside are also excellent at what they do, so there is some serious competition out there! Also, this win is particularly significant because it represents sales of the very latest, most cutting-edge products out there in the industry - anywhere. It means the FPE Automation team worked alongside you, our valued customers, to create vision inspection applications that didn't exist before. Together, we innovated, made processes better, more accurate, and more efficient. If you are reading this because you're getting to know us, perhaps considering working with FPE Automation, we want you to know that we're actively out there in the field, helping manufacturing facilities improve their processes with the most advanced solutions on the market. As you know, that's no small accomplishment. So, we'd like to thank YOU, Cognex and our valued team here at FPE Automation. We're honored! FPE Automation, Inc., an Elk Grove Village, Illinois-based distributor of leading edge automation, established in 1963. 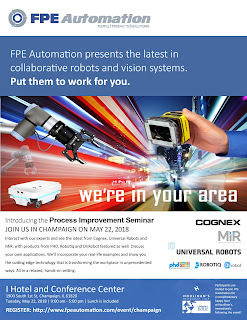 On Tuesday, May 22, 2018, they will bring their own expertise, along with three top-tier, global manufacturers of robotics and machine vision products to Champaign, Illinois. Cognex, MiR and Universal Robots join Automation at the I Hotel and Conference Center. The workshop, entitled “Process Improvement Seminar”, is tailored to local businesses with manufacturing facilities. Students currently accepted into area University-level engineering schools are also welcome to attend. Each presenter will appear for a portion of the day. They will work with attendees to improve their manufacturing processes by adopting the newest technology from Cognex, MiR and Universal Robots, and the latest from PHD Inc., Robotiq and OnRobot. Collaborative robots (cobots), and vision systems are transforming the way we produce products in the USA in unprecedented ways. This transformation has a huge impact on our country’s future and their competitiveness on a global scale. The presenters are prepared to discuss real-life applications and actual examples brought to the event by the attendees. They will interact with the audience and tailor their presentation to their specific challenges and needs. The goal is to streamline their operations in ways that will bring them a return on investment, and in many cases can even make their working environment safer and their product better. Attendance is free of charge to manufacturers in the region. Lunch is included. The material being covered is not suitable for the general public – engineering students and those actively working in the manufacturing sector only, please. 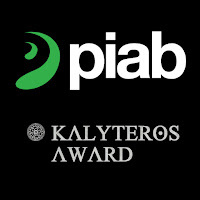 We had to ask... the folks at Piab explained that Kalyteros is Greek for "better". Those who know Tom Krien recognize that he does indeed strive every day to architect better solutions for his customers. Tom's attention to detail, combined with a wide range of industry experience, make him one of the best in the business. The Kalyteros award is a great fit for Tom, who isn't the type to settle for "good enough". 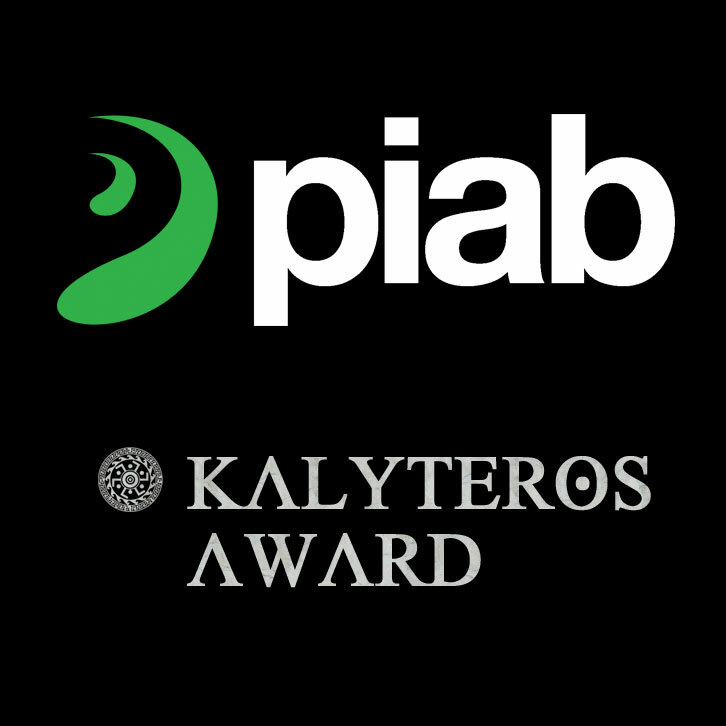 We'd like to thank Piab for the honor! On February 1, it was also announced that FPE Automation is the Piab Diamond Award winner for 2017. It's Piab's most prestigious award. Achievements like these are built one solution at a time. We team up with Piab to work side by side with our customers. Looking back, we're thrilled with the year we had working with all of you, and look forward to more adventures to come.